When you have a hard day to face, this meditation will give you absolutely powerful energy and it will balance your most effective computer -- the brain. The meditation can also be done when you can sleep afterwards. It is the best thing to do for “brain drain". The only thing better is to do this exact mantra and mudra in shoulder stand. However, this should only be done with a wall for support. Sit with your spine straight in a comfortable meditative posture. 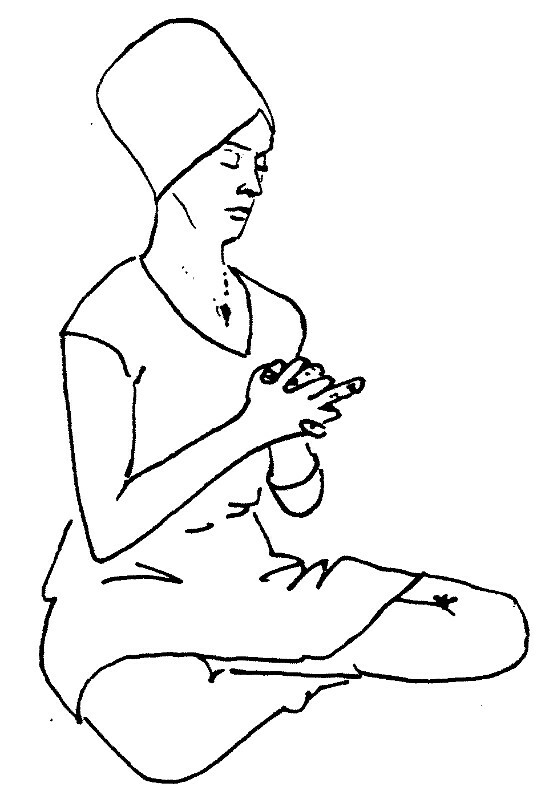 Place your sun fingers together and interlace all other fingers. Your right thumb goes on top. Hold your hands several inches out from your diaphragm with your sun fingers pointing upward at 60°. Close your eyes. Inhale deeply and powerfully exhale as you chant the mantra ONG (00000NNNNNNNNNNNNG). Keep your mouth open, but let all air flow through your nose. The sound is far back and up in your soft palate. When chanting in a group, each person should use his own breath rhythm. The power of this chant, when correctly done, must be experienced to be believed. Only 5 repetitions are necessary to totally elevate the consciousness. This meditation should only be done when you can relax afterwards!